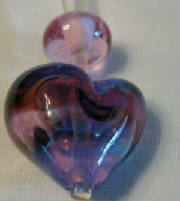 Hollow purple lampwork heart bead done in purples and blues. The bead measures about 15mm long by 18mm wide. Also included is a transparent light purple spacer bead. Price: $5 for the set of two beads. "Streaky Red" A hollow puffy lampwork heart bead. The transparent bead is done in red, hot pink and a splash of yellow and white. The heart measures about 18mm wide by 15mm long. Also included is a matching spacer bead. Price: $5 for the set of 2. 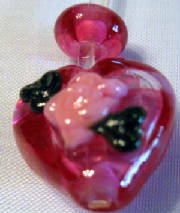 "Rose Hollow Heart" A puffy hollow lampwork heart done in crystal and hot pink. The heart measures about 18mm wide by 16mm long. The small rose is done in a medium opaque pink with green leaves. Included is a matching spacer bead. Price: $5 for the two beads.